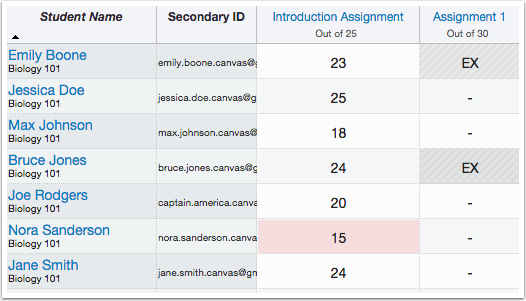 The June 27, 2015 production release includes a new feature that allows instructors to excuse individual students from an assignment. To excuse an assignment for a student, enter the letters "EX" in the corresponding Gradebook cell. The Gradebook will reflect that the assignment is excused for the student. Excused assignments are not included in the calculation for a student’s total grade. Individual students can also be excused from a Group Assignment; the other members of the group will still be able to view and submit the assignment. When students have been excused from an assignment, they'll see "Excused!" on the assignment submission page. "EX" also appears on the student's Grades page instead of a score. Students who are excused from an assignment will not be able to submit the assignment, though they can still view the assignment details. Please note that this is the first phase of allowing instructors to indicate the assignment status of individual students. In future production releases, expect to be able to choose from late, missing, and absent, in addition to excused status.